What does everyone expect from you? What do you expect from yourself? Sound challenging? Unquestionably, it is. That's why this conference was designed — to help you do your job better in the face of increased demands and pressure. You won't find workshop leaders rehashing basic job functions; their goal in this secretary seminar is to help you develop the success and survival skills that make the difference between "just getting the job done" and being truly exceptional at what you do. 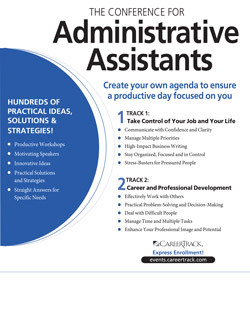 This administrative assistant seminar was designed with you in mind, offering a unique two-track format that lets you select from 10 power-packed sessions, making it easy to jump from track to track, choosing the course that are most relevant to you. And throughout the day, you'll have the opportunity to meet and network with individuals who really understand what you do … because they do it, too. Be fair and professional as they juggle multiple tasks, multiple bosses and conflicting responsibilities. Write better business communications — the kind of clear, compelling writing that gets read, acted on and remembered! Stay in control during stressful situations and keep their cool, no matter what. Develop their leadership qualities and win the support and respect of others. Refresh, revive and recharge themselves … and go back to work with fresh ideas and a renewed attitude! This incredible secretary training event brings together nationally recognized speakers and workshop leaders, creating an unprecedented opportunity for you to learn and grow professionally. After taking this class, you'll return to your job renewed, energized and brimming with fresh ideas and strategies that will make an immediate difference in your performance, attitude and productivity. Review the basics of effective communication and learn how to apply these powerful principles on an everyday basis, in every professional situation. Professional tips from the greatest communicators: Put them to work for yourself! Body language: Understand vital messages that are unspoken, yet critical in the communication process. Talking vs. listening: why listening is more important than most of what you say and how to really hear what’s being said. How to speak with more confidence and power: Be more persuasive and memorable in all your communications. Sort through all of the priorities you’re juggling and put them into a perspective that’s manageable and workable. How professional project managers do it: clever techniques you can apply to your job! The importance of details: how to use a tracking system to ensure you never “drop the ball” again. Creative ways to get others to help you: Rally the support you need at work, at home or anywhere. The truth about deadlines: how to use them to get more done and take on more responsibility (without the pressure they usually produce). Learn how to get results from everything you write and make the kind of “written impression” that enhances everyone’s image — yours, your boss’s and your organization’s. How to clarify the main points in any written communication and get rid of “waste words” that cloud your message. The power of editing and proofreading: Spot insidious mistakes that can destroy the credibility of written communication. Up-to-the-minute guidelines for “e-writing:” how to communicate better by email with an indispensable list of dos and don’ts for electronic messages. Writer’s block: how to confront a blank page without fear and anxiety! In your role, you’re expected to function as “command central” in your office — keeping track of information and people no matter how hectic things get. This dynamic session will show you dozens of tricks to do it better, in the many situations you deal with — all without missing a beat. How to keep everything moving smoothly when your boss or key personnel are away. How to deal with multiple bosses and conflicting demands with incredible diplomatic skill! Your information system — whether it’s written, verbal or electronic, organize the flow of information so it is easily accessible to you and others in your office. Ways to cut through the clutter: Organize your desk, schedule and workflow to become more productive and efficient all day, every day. Protect your health and your relationships by learning how to avoid falling victim to stress. Warning signs: how to tell if stress is approaching the danger level. Common stressors and sparks: eliminate the triggers that start your blood boiling. Step-by-step strategies to de-stress your life and regain the calm you need to succeed. Coping techniques for high pressure: how to keep your cool even when chaos surrounds you. It’s the secret ingredient in the most successful careers — the ability to communicate one-on-one, with virtually anyone, at any level. Increase your ability to work more productively with every person you encounter in your job. How the communication loop works and why you must give effective feedback to win cooperation and commitment. Realistic rules of positive criticism: how to communicate negative information without creating ill will. When you’re being criticized: how to receive negative feedback and how to respond. Technology tactics: Understand how today’s technology affects your communications and how to ensure it doesn’t weaken your ability to communicate one-on-one. Learn strategies for resolving problems (big or small) with ease and confidence. Gain the trust and respect of your boss and coworkers as a professional who can handle tough situations and make sound decisions. Step by step: a decision matrix will make it easy to visualize the consequences of your decisions before you jump in! Decision by committee: how to include others in decisions without stalling the process. How to know which decisions to make yourself and which to leave for someone else. Creative problem-solving: how to come up with unconventional solutions to problems and break through the mental blocks that hide innovative ideas. Virtually no workplace is safe from those frustrating and demanding people who make it difficult for you to do your job. Whether it’s a boss, a colleague or someone outside your organization, you’ll discover how to react with skill, composure and confidence. Do you know these perplexing people? The four toughest types and specific strategies for dealing with each. How to take charge of a challenging, escalating situation and look like a hero in the process! What to do if you’re reaching the boiling point and how to keep your cool no matter what happens. Difficult person or difficult situation? Learn how to tell one from the other and avoid the mistake of mixing people with issues. Harness the power of proven time-management techniques — ideas to cut the waste from your day, free up time to accomplish more and help you feel more organized. The top five interrupters: how these common time-eaters could be wreaking havoc with your schedule. Time-saving technology: how e-strategies can shrink the time it takes to accomplish common tasks. Procrastination: motivating ideas to stay out of this trap and ensure other procrastinators don’t pull down your productivity. Creative tricks to manage the time of your boss and coworkers and gain more control over your own. Take charge of your future! Target specific strategies you can use to immediately boost your professional presence, credibility and leadership potential. Essential skills of managers and supervisors and how to develop them yourself. When, how and what to delegate to others and how you can increase your power by sharing it. The respect and credibility you deserve: what you must do, every day, to win the admiration and trust of others. Ten surefire ways to enhance your professional image.